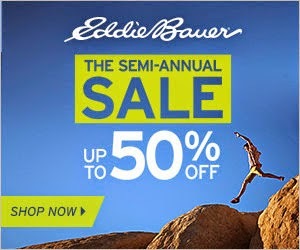 Eddie Bauer Stores is offering up to 50% off your purchase for their Semi-Annual sale. Plus, Shipping is Free on orders over $99 with Coupon Code SAILFISH. Plus, don't forget to sign up with your Email at the bottom of the Eddie Bauer website to get a one time 15% off shopping code for online or in store.